An employment ad for the Longmeadow Director of Adult Services was posted earlier this week on the Town website. While the ad describes it as a "full time" position, the current position is budgeted at 30 hours/ week. 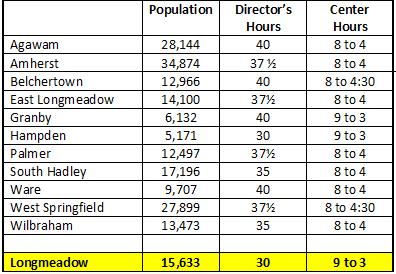 The Longmeadow Select Board should consider increasing the hours and salary of this position to be comparable to surrounding towns to show their commitment to a rapidly increasing segment of our population. The ad states that this Director position will be under the general supervision of the town manager- hopefully, that means that this position is a participating member of the TM's staff. Let your voice be heard! Be an advocate; be proactive, not reactive. As a former member of the Longmeadow Council on Aging Board of Directors, I am very familiar with the population that is served at the Adult Center, all the services and programs provided including lunches and Meals on Wheels, and the need for a continuum of care for our senior citizens. Our senior population is the fastest growing segment of not only our town’s population but the country as a whole and its projected growth is even more substantial. That being said, I would like to emphasize the need for a “full time” director; this is not a part time position. The Adult Center should be opened at a minimum the “typical” hours of the other town departments. The population that is served are senior citizens and not school children. Therefore the hours of 9 to 3 are unacceptable and inadequate for the population of the town. This is no longer “a mother’s hours” job. And by the way, the town of Longmeadow is presently the ONLY town other than the little town of Hampden who does not have what would be considered a full time director and furthermore whose Council on Aging has no staff positions that are full time. The Senior population, especially in today’s economy, needs a facility that is open to them with more hours and serviced by at least one full time staff member – which should be the new director. May I suggest that the town hire a full time person (probably at a lesser wage than the former 25+ year employee) and expand the hours of operation at the Adult Center. That would be the ideal scenario. After all, if you are going to pay health benefits for a 30 hour employee, you might as well reap the rewards – 40 hours’ worth of work! In essence, if you replace a 30 hour person with a 40 hour person at the same or lesser wage level, you increase the productivity by 25% but you do not increase your costs. There would be absolutely no impact on the budget. That’s a win win situation. Good for the Town and good for the Seniors. I suggest that all of us who are in favor of a Senior Center (our Adult Center) that is open 40 hours a week with a full time Director please call our Acting Town Manager, Barry DelCastilho at (413) 565-4110 and tell him so.